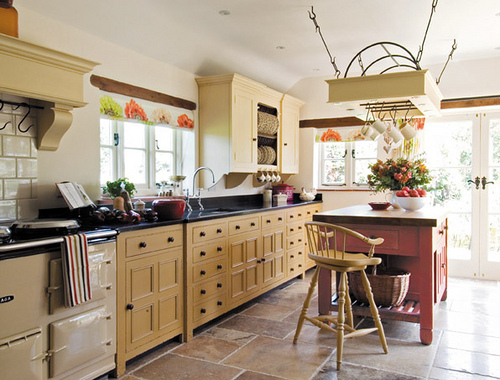 Your kitchen colors should reflect a warm, cozy environment to facilitate family gatherings and parties. Both mixing and matching colors can produce a cohesive overall effect that reduces any chaos or makes the room look cluttered. Homeowners can both modernize and completely change the look of their kitchen with some new paint on the walls, according to Remodeling Center.com. Because you want your paint job to be a success, it is optimal to spend adequate time picking good colors to paint the kitchen. The stove doesn't have to be the only thing in the kitchen that gives off heat. Warm tones can produce a cozy ambiance when used as wall paint. In addition, hues such as reds, apricots and yellows also act as appetite stimulants, according to Leatrice Eiseman. These colors can be paired with a variety of colors that reflect the architecture of the home. For example, yellow was a popular color of choice in the Victorian era. You can mix up the color palette with a brown to marry the past with the present and set of any wood paneling or cabinetry. Apricot is also traditionally used in Southwestern architecture as an exterior color. You can match the outside color with the color in your kitchen, which makes the room look especially cohesive if it is attached to an exterior patio area. Many kitchen appliances are made in dark colors. For instance, coffee makers, cast iron pans and dishwashers are often black or a gray. You can add a splash of color behind an otherwise dull landscape by using a bright color. If you have cabinetry or tiling in the room, it is best to pick a color that will complement. The entire room doesn't have to be one bright color. In fact, oftentimes a room of one color can appear flat. You can pick one wall to paint with a bright color like turquoise, henna or orange. The rest of the walls can be painted a lighter shade of the vivid hue. Also, you can add emphasis to the cabinetry by painting them a bright color and leaving the background a subtle hue. It will give your cabinets an eye-catching pop and add energy to the kitchen. Paint companies are answering the pleas from homeowners for newer colors in their inventory of paints. Hues such as daiquiri green, cantaloupe pink, chocolate, misty yellow and tender greens are showing up in collections of paints. Many of the newer paints have been inspired by the growing "foodie community" and ethnic colors. In fact, there are plenty of colors that people can find available that remind them of where they grew up in a foreign country. If new hues aren't your cup of tea, use unusual color combinations. Install hot-pink tiling and use a silver for the walls. You can faux finish your walls to incorporate depth, dimension and color to the kitchen. Faux finishing is the result of painting an under-layer color and adding color through a variety of applications, such as using sponges. You can also use a different finish like a high sheen that can transform the look of the room. It's easier to wipe off fingerprints from high sheen finishes as opposed to eggshell finishes, and high sheen also reflects abundant light.